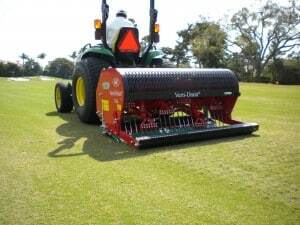 Equipment we use for golf course aeration will help improve your golf greens and fairways for optimal play. Deep Tine Aerators penetrate deep into the soil to maximize water percolation, stimulate root growth, and improve air flow to the root system. Deep tine aeration creates a 4″-16” channel can be created in squares every 2″-4″. These channels allow air to penetrate the soil providing the plant roots the required oxygen needed to thrive and grow. As new roots develop, the young roots enter the deep tine channels and are able to extend deep into the surrounding soil. A deep root system created healthy plants, enabling them to withstand drought periods and extended periods of high temperatures over the summer. Deep tine aeration is far superior to traditional core aeration for golf course maintenance.